Sized so an entire classroom can see them, these giant molecular models are made from durable polyethylene. Each atom is about three centimeters in diameter. 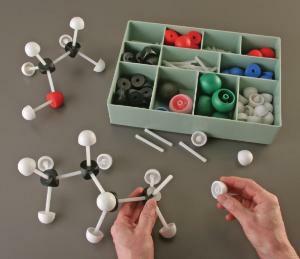 The set includes flat orbitals with electrons to bring a traditionally hard-to-visualize concept to life–how orbitals occupy space in the molecular structure. Ordering information: This set includes 30 carbon atoms, 50 hydrogen atoms, 5 nitrogen atoms, 10 oxygen atoms, 7 halogen atoms, 20 orbitals, 50 standard joints, and 100 colored flexible joints.